A Healthy Snack is always a useful thing to have stored away in your cupboard for those times when one gets the munchies; it saves a multitude of other options, usually sugar laden carbs which do little for the emotional morale at such a time. I think I have shared a very similar recipe with you before to the one below, except it uses Tamari sprinkled over nuts of choice, sunflower & pumpkin seeds. I often make this, as not only is it a great snack but lovely to sprinkle over salads. This new recipe has a slight twist with the addition of pumpkin & rolled oats. After you've whipped up this treat from Brittany at Eating Bird Food, with a few of my own additions, just know that it makes a great snack. Thank You Brittany. Mix Sweetener of choice, cinnamon, paprika, and mixed spice in small bowl. Set aside. 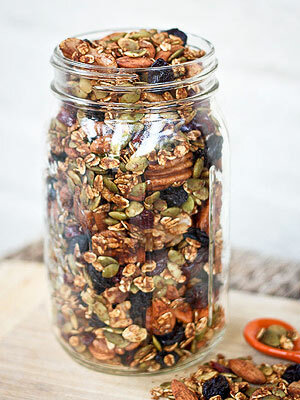 Place almonds, oats, pecans, pepitas, and walnuts in large bowl. Mix together pumpkin puree and apple juice; pour over nut mixture and toss until nuts are evenly coated. Sprinkle with spice mixture, tossing to coat well. Spread evenly on two baking pans. Place in a hydrator for 12+ hours until dry & crispy. Cool completely. Stir in cranberries and raisins. If you do not have a dehydrator you can pop the mixture in the oven for 30 mins, stirring half way through. Test to make sure it is dry before cooling. Store in airtight container.